Wrestling can involve a lot of different sports. Two main Olympic sports are Greeko Romanand Freestyle. You could say Judo is another form of wrestling, professional wrestling is even more complicated and has a language of its own. There is the worker, the jeerer and the shooter. The worker is the established showman and the jeerer is the stooge for the established showman. The shooter is a good amateur wrestler who wants to make some money. However, the showmen have to try to keep him out as they are not capable of beating the experienced amateur so the shooter is the answer to the problem. I had a friend called Diarmuid Hagarty who was deaf but also the greatest wrestler that came out of Ireland. He trained in Boring Wood, north London with Chris Sheedy who was his coach. Chris was the father of the Irish soccer player Kevin Sheedy. 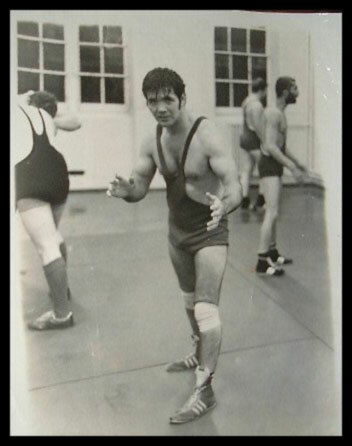 He was a great wrestler and an even better coach. One day Diarmuid went to Dale Martin�s Promoters. There he met men like Rebel Ray Fury who was of Iranian origin. He was the shooter for Dale Martin�s at that time. He tried to rough up Diarmuid but Diarmuid was too strong and too good a wrestler for him. When they couldn't beat him they worked with him and so Diarmuid became a big star. He appeared on television on Saturdays in 1978. Also there was another well known Irish man in London called Butty Sugrou. Butty was a Kerry man from Kilogran and an ex Duffies Circus Strongman, and therefore well known all over Ireland in the 1950�s.
. Also the man who dined with the Queen Mother at Buckingham Palace and the same night slept with Paddy McCarty the Tinker under London bridge. Jack looked like a proper Gentleman that night. He was dressed in a black suit with his trademark the Red Rose on the lapel. You could see yourself in the shine of his shoes and he had a rolled umbrella which he carried on a hook in the inside pocket of his jacket. He went on stage and sang ?a href="jack.html">Down Mexico Way?which was one of his favourite songs.
. Most of them were harmless but they were determined to try me out. One of them was a man called Peter Crotty. Peter was from Dungarvan and a 1955 All Ireland Champion Boxer. He had boxed an American Golden Gloves Champion and in his hey day he was nicknamed the Clonmel Iron Man, the club he boxed in was in Clonmel. One night he came in to the Wellington and got stuck in to Butty. It was my job to calm down the situation and I managed it with little trouble. He then faced up to me, so I immediately tucked his inside arm in to a move called an arm drag and pulled it. At this point he could not move, this was nothing very special, it�s just what wrestlers do all the time, much like a boxer would give a left jab. It was quiet easy to put Peter out and it did seem to impress some of the punters who looked up to Peter, who at that stage of his life was the worse for wear. After that the situation improved and generally things got quieter. I was training very hard at that time and I remember one day I tore a muscle in my back. It was a Saturday night so I had to go to work. There were 3 bars in the Wellington Pub and I was in the saloon. A fight broke out in the public bar, 2 Dublin men got hold of the barman and one of them broke the end of a bottle. He was threatening to kill him. I was on my own so I opened the door of the public bar quickly and when the men saw me they ran out. I was delighted that they did because I could barely stand up never mind fight. Looking back I am glad now that I never hurt anyone and thank god I wasn't killed. Butty started to put on wrestling shows. He employed Brian Dixon who was the Northern Promoter and then put on the show. I wanted to join in the fun but as usual the showmen wanted the limelight to themselves. The only time I got chance for a bout was when someone didn't turn up, and even then is was begrudgingly. I worked along with them but they had their plans to get rid of me. One day when Brian Dixon wasn�t present I was asked to wrestle with a man called Billy Graham. I am sure he wasn�t the American Evangelist. We exchanged the usual talk planning the beginning, middle and end which is what normally would be planned for an even fixed bout. When the bout started I knew straight away I was in fight. He was the shooter. He slapped on a move called the front head chancery with a bar across the chin and the head turned sideways. This move is called a neck breaker and is as old as the Roman Emperor. Also the Ancient Greeks used this combat move. He was very strong but I managed to get to the canvas with my neck still in tact. I stayed there for the entire round which was three minutes, it was the longest three minutes of my life and the punters must have been bored out of their minds. Finally the bell went off, I got up and staggered back to the corner, I was exhausted. The bell went for the third round, I went out in a deep crouch. I am five foot eight in height but in a crouch was about four foot. Billy Graham is six foot tall so I was making it difficult for him. I went for his ankle and shoulder checked his inside knee he went down like a bag of spuds, hitting the canvas with his backside. I knew it was no good pinning him because the ref wasn�t going to count, so I got up quickly and waited for him to do likewise. As soon as he did I repeated the manoeuvre. He then got up and went in to a deep crouch which didn't suit him so I tucked him with a move called the flying mare. He went crashing in to the canvas and I could see the ref beckoning to the time keeper. The bell went again after only about two minutes. The ref then went to Billiy Grahams corner whereupon they talked frantically. I now think the ref wanted to stop the contest, or the non-contest but he came out for the forth time. He swung a side shin kick to my thigh which cut into the muscle. I felt a sharp pain but I smiled at him and offered the leg for him to take another kick, but to my surprise he offered me his hand, the contest was over. Later we all congregated in the same room where we had got changed twenty minutes before. Monty Swan was the spokesman for the Wrestlers. His initial worry was that Brian Dixon shouldn't know what had happened. The promoters did not approve of shooters wrestling in front of punters, mostly because it looked boring in comparison to a fixed bout.
. But there was a snag I would be the shooter. I told them that I wasn't interested in shooting as I was an amateur with some prospects and was rated number 3 in the United kingdom with the prospect of becoming a British Champion. At this time there was a boom in building and Griffin Bros was expanding at a great rate. I was the Manager and Director and was responsible for up to 40 employees all over London. Later I got some work with Brian Dixon the Wrestling Promotor, it was professional showmanship and not shooting which I was very pleased about. I wrestled the the �Wild Man from Borneo?who was a Siek Indian. He owned an Off Licence in Shepherd's Bush. I also wrestled a Canadian called Clandike Bill who was about 35 stone. I had done what I was asked to do which was usually to get thrown out of the ring, be carried away, knocked out and I collected my winnings for my trouble. Some time later Butty changed Promoters he brought in Dale Martin the top Promoter from Brixton Height Road.
. I left the Wellington to concentrate on my Plastering Business and Diarmuid took over the minding job for Butty. I wrestled professionally just the odd time and Butty put up ?000 to any man who would wrestle Diarmuid. I backed myself for the same amount. Of course I wanted to relieve Butty of his money and the preparations began. It was Friday at one o'clock and Diarmuid and myself were communicating by writing notes. We had planned to give a good show and relieve Butty of his ?000 and we were discussing the best way to do that. There was another wrestler in the room where we were changing and he went to Butty and the Promoter and told them that we were planning to work the bout. Butty being the sort of guy that he was withdrew his ?000. I told them that I wouldn't follow suit, therefore my ?000 would stay. We went to the ring without any more discussion. The bell went off, Diarmuid made the first attack, crashing in to me like a bulldozer. We both fell out of the ring and climbed back in still fighting. The ref acted as if it had nothing to do with him but just about every illegal move was being tried out by both of us, neither of us would give an inch. The Saloon bar of the Wellington was packed to capacity and there was about 400 people there. My two brothers Christy and Paddy had taken the day off from their plastering work. We were both seasoned old-timers and knew each others moves. We counted each other out most of the time, and at the end of the third as Diarmuid was tiring I tucked him down and fought him in to ground defence. I put on a quarter nelson at the forth back for about thirty seconds until the bell went. My quarter nelson is well known and Terry Blackburn (the wrestling coach for the Forresters Amateur Wrestling Club), once said that if Con Griffin gets you in a quarter nelson and if you suffer from blackheads, when he is finished your blackhead problems will be over and you might have other problems.
. Jack Doyle. The man from Cobh, Butty had always told Jack that when he died he would bring him back to his home town to bury him in Cobh. But Jack after a life of drunkenness and recklessness, still alive, although just about, was to live another 6 years. A hotel in Cobh paid to have his body brought back to Cobh where he was buried. Cobh is now famous for two things, the Titanic which sank and Jack Doyle who sank millions of pounds worth of drink. Dear mud went back to Cork to live in the city and he worked as a carpenter around Ringside for some years. I came to live In Ryan 11 years ago. One day in Cork City a man with a walking stick came over to me in a restaurant, he smiled and put up his thumb. I couldn't believe my eyes, it was Diarmuid still looking like he did all those years ago. He sat down and we got out a note pad, he told me that he had suffered a stroke a couple of months before his 60th birthday. I asked Diarmuit if he would attend my 50th Birthday in Rylane the next Thursday Night, it was being held in Kelleher's Bar just across the road from my house. He said that he would be delighted. On the Thursday night the Bar was packed with people, one of the biggest crowds ever seen in the bar. Diarmuid arrived with his wife and son. We got a notepad and discussed old times. Between us we had 60 years of wrestling experience and plenty to remember. We talked about the time he wrestled the great Joe Feeney of Dublin and several other things. Before long we had used up a full notepad. I sang a song and introduced Diarmuid to the crowd. They didn't appreciate this great sports man because they didn't know, like I did what that man had gone through and experienced in his life. One day I am going to tell the story in its entirety. I will write a book of mine and Diarmuid�s experiences, hopefully then lots of forgotten greats of the wrestling world will get the recognition that they deserve for incenc the grate Mick Murphy from kerry the man who won the Rostorton in 1959 was a Greate Wrestler in London in the 60th,s 70th,s and up until the 1980 th,s. Chris McGuire from Cavin who Won severl London championchips - Other than the distinctive dial, this is pretty much the same chanel replica super dive watch that Rolex has been producing for a while. Features include a hublot replica case, Monobloc middle case with rolex replica and Cerachrom black ceramic bezel insert. The 17.7 mm-thick steel case uses the longines replica sale system and has a 5.5 mm Sapphire crystal. The replica Rolex sale Deepsea D-Blue watch is water-resistant to an impressive replica watches sale feet.